Sodium alginate (C6H7O6Na, CAS NO. 9005-38-3) , also called Algin or Natural Gum, is a macromolecular compound with high viscosity, and typical hydrophilic colloids. Because of its properties of stability, thickening and emulsifying, hydratability and gelling property, it is widely used in food, pharmaceutical, printing and dyeing, etc. 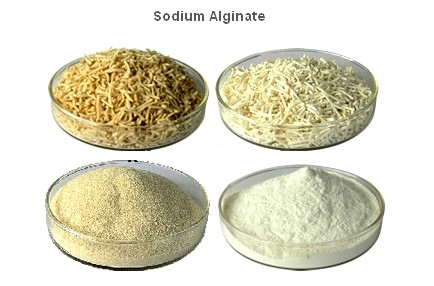 What is industry sodium alginate used for? Industrial sodium alginate is mainly used for printing and dyeing industry. Sodium alginate owns a long story as printing paste, yarn paste and cleaning paste. It is a kind of excellent paste for printing, which is applicable for printing cotton, feather, silk and compound fibre especially using with active colouring matter. Sodium alginate is superior than the other pastes like starch and guar gum etc. The largest characteristic is that it can’t react with active colouring matter and can’t produce covalent bond. It contains CHOH instead of hydroxymethyl; meanwhile, there is carboxyl with strong negative electricity on its base ring. It not only absorbs colouring matter, but also owns the property of exclusion that can make colouring matter move towards fibre from paste. Therefore, the textile with sodium alginate is brighter in colour, cleaner in lines, high quantity in dyeing yields, good evenness in printing, and great performance in permeability and plasticity. In addition, friction resistance can also be improved. So sodium alginate is widely used in dyeing industry. Sodium alginate of food grade is widely used to replace starch, gelatine as the stabilizer of ice cream, beverages and many dairy products. It can improve the stability and cohesiveness of products, reduce fluid exudation and make the tension strong. Salad dressing, pudding, jam, tomato paste, canned food, try noodles, vermicelli, rice vermicelli, bread, etc. In medicine field, because of its unique physical and chemical properties and good biological compatibility, sodium alginate has wide use in pharmaceutical preparation, tissue engineering, clinical treatment and cell culture. It is also used in dental area, cosmetics and masks.